This is a challenging detour off the Eastern Okataina Walkway. It is mostly off track with only basic markers. 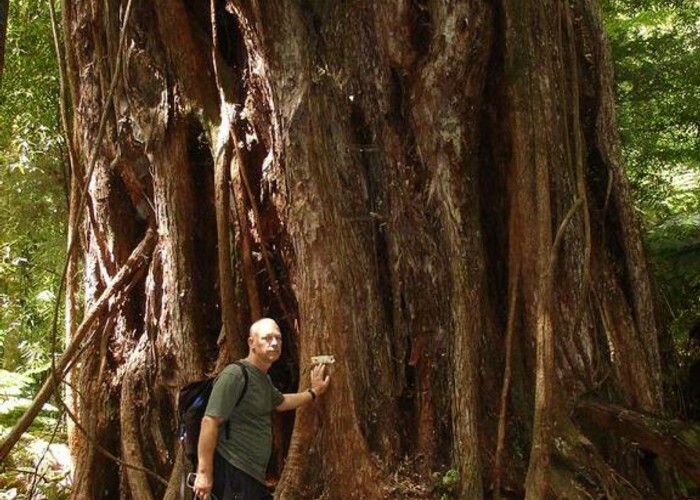 Good routefinding skills required but the opportunity to visit these huge and ancient trees. The Cathedral • By pmcke. This trip begins at the end of the Lake Okataina Rd opposite the lodge. Start along the Eastern Okataina Walkway and go for about 30mins and you will arrive at Kaiwaka Bay. There is a signpost here by the lake. The Phantom • By pmcke. Look up into the bush directly above the signpost and took for a permolat marker on a tree. It has scratched into it "Lone Tawa via the Cathedral". This is the beginning of a permolat marked route which has adequate but not excessive markers. There is only a light pad on the ground so follow the markers. They soon start to climb steeply up unrelentingly for about 300m. If in doubt, the next marker is probably straight above you. This route makes no consessions to the slope. 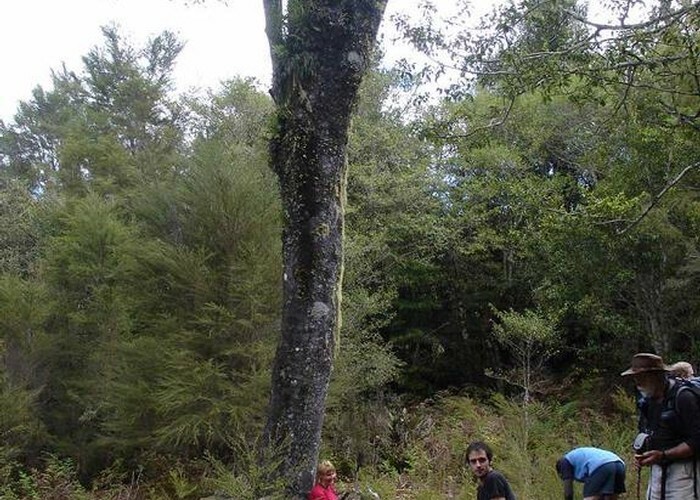 Climb up from the junction, still following permolatsand pass to the left of a very large Rata tree. This is the second largest Rata that you will see today. On the next little terrace you come to the complex route system of the tree we call the Cathedral. You can carry on up from here following markers until you come to the Lone Tawa. There is nothing special about this tree but it is in a little clearing and is a sunny place to have lunch. This is on the edge of the scenic reserve and beyond here logging activities have taken place. There is a complex of old logging roads that can be followed. From the Lone Tawa retrace your steps to the permolat that said Giant Rata. You are firstly following permolat but these soon run out and you are following pink tape markers. 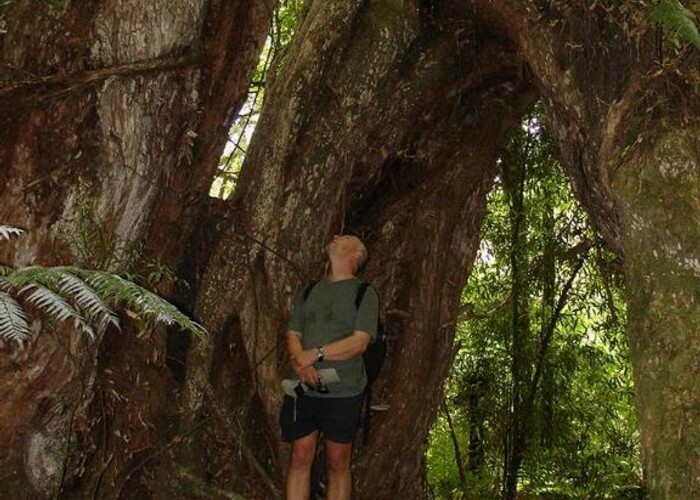 The route can be difficult to find but you are generally following the contour and the route winds around to visit a number of Rata Trees of varying ages. Eventually, without much warning you come to a huge Rata with a significant lean on it. Look a little past here and you will see the Phantom. A giant tree with a squat trunk but then branches soaring into the heavens. It is surrounded in attendance by other huge trees. From the Phantom we pick up the permolats again and the route descends steeply, relieved by traverses along little terraces before dropping steeply down a gully and suddenly you are back on the Eastern Okataina Walkway again. The Lone Tawa • By pmcke. Follow the track back past Kaiwaka bay and back to the road. If you have time, take a side route to see Te Koutu Pa on a prominent peninsular in the lake. There are well preserved food storage pits that are worth seeing. Added 25 May 2008 by pmckepmcke. 2 revisions, most recently 29 December 2008 by pmckepmcke.